Panels are the display screens which act as surface for display and control components and serves as the direct interface for human/machine dialogue to display information in various forms such as text, video, picture, and others. These are used in several applications, such as TV, desktop monitor, notebook PC, tablet, mobile phone, automotive, digital signage, and others. The panel industry is witnessing rapid technological changes and OLED panels have currently become the emerging and potential technology. However, the display panel market is currently dominated by LCD panels which accounted for about 86.80% of the global display panel market in 2014. The market for display panels was valued at USD 114.16 Billion in 2014, and is expected to reach USD 156.57 Billion by 2020, at a CAGR of 5.60% between 2015 and 2020. The market is expected to be driven by the growing demand for large-sized UHD display panels for TVs, increasing demand for automotive and digital signage displays. Although the Asia-Pacific market accounted for the maximum market share in 2014, other regions are expected to witness higher growth rates during the forecast period. However, the market is restrained by factors including the overcapacity and decreasing price of panels that result in the reduction in profit margins and revenues. Currently, Asia-Pacific accounts for the highest market share, as it is a well-established market and because of the increasing adoption rate of consumer products. However, the market is very small in other parts of the world including North America, Europe, and the RoW compared to Asia-Pacific. Asia-Pacific is expected to maintain the largest share of the market during the forecast period, driven by expanding panel manufacturing capacities, developing new and innovative panel technologies, established infrastructure for both panels and consumer electronics manufacturing and potential market for consumer electronics especially in China. It also provides a detailed analysis of the current market situation and the market till 2020. The report also analyses the market dynamics and the value chain of the market by considering the key stakeholders from panel vendors to OEMs. This report profiles the major players which are active in the display panel market. It also comprises the competitive landscape of the main players including the key growth strategies and market share analysis of the same. Some of the key players profiled in the report are LG Display Co., Ltd. (South Korea), Samsung electronics Co., Ltd. (South Korea), Innolux Corporation (Taiwan), AU Optronics Corp. (Taiwan), Sharp Corporation (Japan), Japan Display Inc. (Japan), BOE Technology Group Co., Ltd. (China), Panasonic Corporation (Japan), HannStar Display Corporation (Taiwan), Chunghwa Picture Tubes Ltd. (Taiwan), and others. This research report categorizes the global display panel market; based on technology, size, form factor, resolution, application, and geography; it also covers the market size forecast of the display panel market. The global display panel market has been segmented by technology into LCD, OLED, and others. The display panel market is further segmented into two sub-segments – small & medium, and large on the basis of size. The display panel market is further segmented into two sub-segments – flat, and flexible on the basis of form factor. The display panel market is further segmented into six sub-segments – 8K, 4K, WQHD, FHD, HD, and others on the basis of resolution. The market for panels has been further split based on application into two sub-segments such as TV, desktop monitor, notebook PC, tablet, mobile phone, automotive, digital signage, and others. The display panel market has been split in to four regions based on geography: North America, Europe, Asia-Pacific, and RoW. The market in North America includes the U.S., Canada, and Mexico, while Europe is divided into the U.K., Germany, and the rest of Europe. The Asia-Pacific market includes China, Japan, Taiwan, South Korea, and the rest of Asia-Pacific, while RoW has been divided into the Middle East & Africa, and South America. This report covers the market by panel technology, size, form factor, resolution, application, and geography. It also provides a detailed analysis of the current market situation and the market till 2020. It also includes the detailed analysis of market dynamics, Porter’s Five Forces model, value chain, competitive landscape, and market scenario during the forecast period. The report also covers the key competitors in the display panel market with their relative market share, revenues, market growth strategies, and mergers & acquisitions. Panels are the display screens which act as surface for display and control components and serves as the direct interface for human/machine dialogue to display information in various forms such as text, video, picture, and others. These are used in several applications such as TV, desktop monitor, notebook PC, tablet, mobile phone, automotive, digital signage, and others. The demand for panels has been increasing at a considerable rate with the increasing demand for large-sized ultra-high definition panels for TVs and flexible displays for mobile phones and growing demand for automotive and digital signage displays. However, the market faces various challenges such as over-capacity, lack of technology know-how of OLED technology, and strict environmental rules and regulations, especially pertaining to the panel production. However, the market is expected to grow at an estimated CAGR of 5.60% between 2015 and 2020. 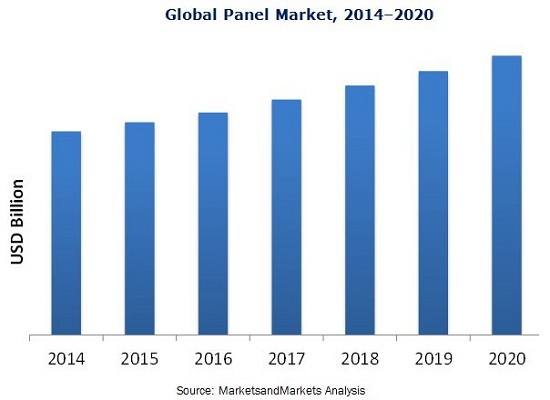 The key market players in the display panel market aim to increase their product offerings and market size in various applications and regions through collaborations, partnerships, new product launches, and by upgrading the existing facilities. The report covers the display panel market which has been segmented on the basis of technology, size, form factor, resolution, application, and geography. Furthermore, it comprises the analyses of the market dynamics during the forecast period, Porter’s Five Forces analysis, and the current competitive scenario along with the market size analysis of the key players. The report also includes the detailed profiles of the major players in the market along with their growth strategies. This report describes the drivers, restraints, opportunities, and challenges pertaining to the display panel market. Furthermore, it analyzes the current market scenario and forecasts the market till 2020, including market segmentation based on technology, size, form factor, resolution, application, and geography. The OLED panel market is expected to grow at the highest CAGR of 22.48% during the forecast period. Asia-Pacific held the major share of 75.59% of the global market in 2014, followed by Europe and North America. Some of the major companies included in the report are LG Display Co., Ltd. (South Korea), Samsung electronics Co., Ltd. (South Korea), Innolux Corporation (Taiwan), AU Optronics Corp. (Taiwan), Sharp Corporation (Japan), Japan Display Inc. (Japan), BOE Technology Group Co., Ltd. (China), Panasonic Corporation (Japan), HannStar Display Corporation (Taiwan), Chunghwa Picture Tubes Ltd. (Taiwan), and others.